The first set I designed is a set called Swim Team. 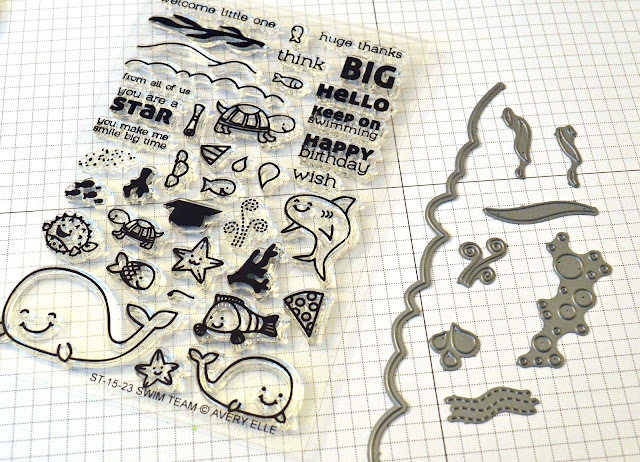 This one has a ton of stamps to build yourself a fun ocean scene. There is a coordinating die set available separately. 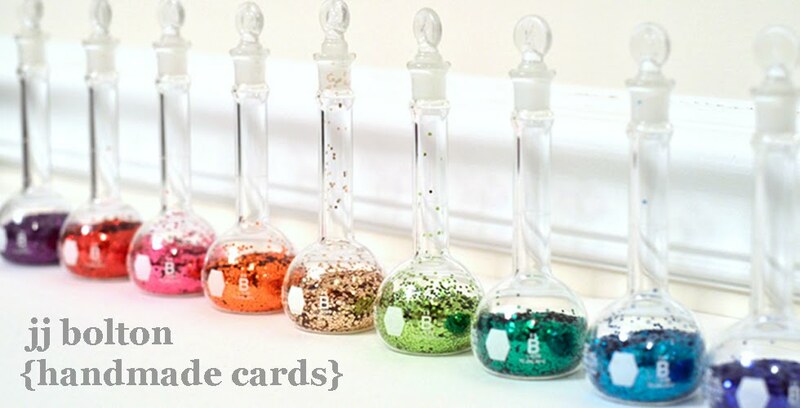 There are so many elements in this set, I didn't do a set of dies to cut out each stamp. Instead, the dies are a combination of elements for underwater scenes and much more (think bubbles, waves, splashing water). The second set I designed this release is the large Petal Panel die with coordinating Petal dies and sentiment stamp set. The Petal Panel die cuts a full A2 sized panel with petals/ tear-shaped cutouts. There is a coordinating stamp set sold separately that can be stamped right in the strip down the center of the die. Also available separately are the coordinating Petal dies give you 4 different options for petals that can be used alone or with the Petal Panel. Can't wait to show you examples using those dies and stamps! The last set I designed is called Geek Love. This one is my favorite:) It is a builder set that has the cutest little nerdy couple. It comes with bits and pieces to change up outfits and hair which is so much fun! I have fond memories of paper dolls and Fashion Plates (anyone remember those? ), so this is super fun for me. 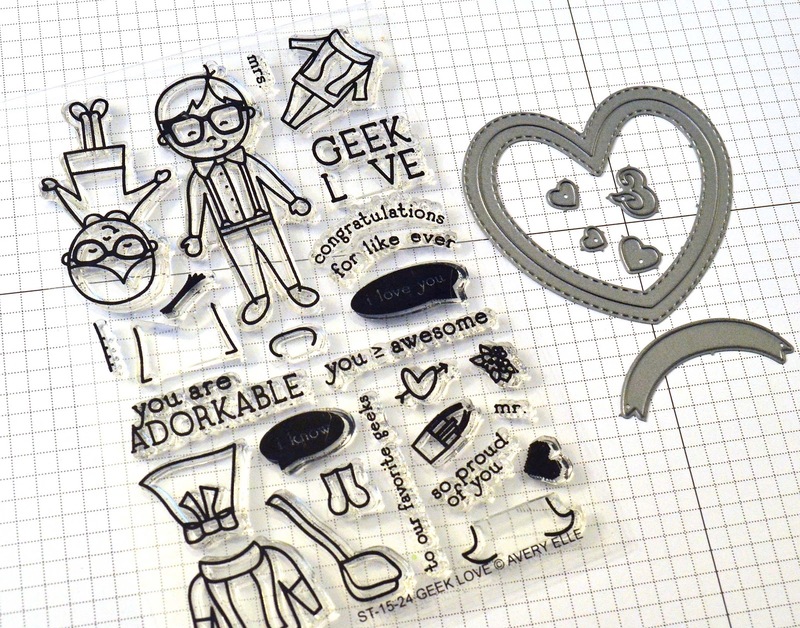 The Geek Love stamp set also has a separate coordinating die set that includes a large heart die (has stitching detail inside and outside of die) and cute banner die that coordinate with some sentiments. 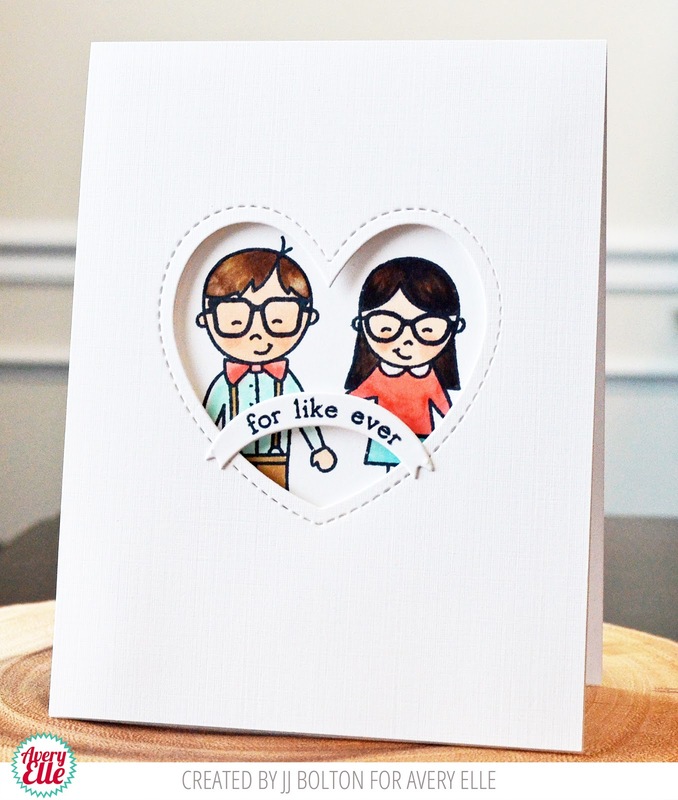 Stay tuned for more sneaks this week and a full blog hop of the new release this Thursday! And definitely check out the Avery Elle blog this week (seriously, right now!) for sneaks for all the new stuff! OHHHMYYGOOSHHHHHH I NEED THESE TWO SETS!!!! GREAT JOB DESIGNING THEM! Sorry for the caps, I'm so thrilled - I can't wait!!!! These are so fun and cute! Can't wait to see the flower one!!! JJ, your sweet card just makes me smile! I'm so stoked about all the new AE stuff coming up this week - woot, woot! Oh how CUTE!!! LOVE this sweet card. The new sets look fabulous!! I love these! So cool! JJ, These are wonderful! I'm so glad to see you designing. I have long loved your CAS card making style. I don't have any Avery Elle, yet... I'm still lurking. LOL The stamp and die industry has exploded since I started seriously collecting stamps and dies in 2005. It's almost torture decided who to buy from. LOL I love your Swim Team and the versatility you have put into it. 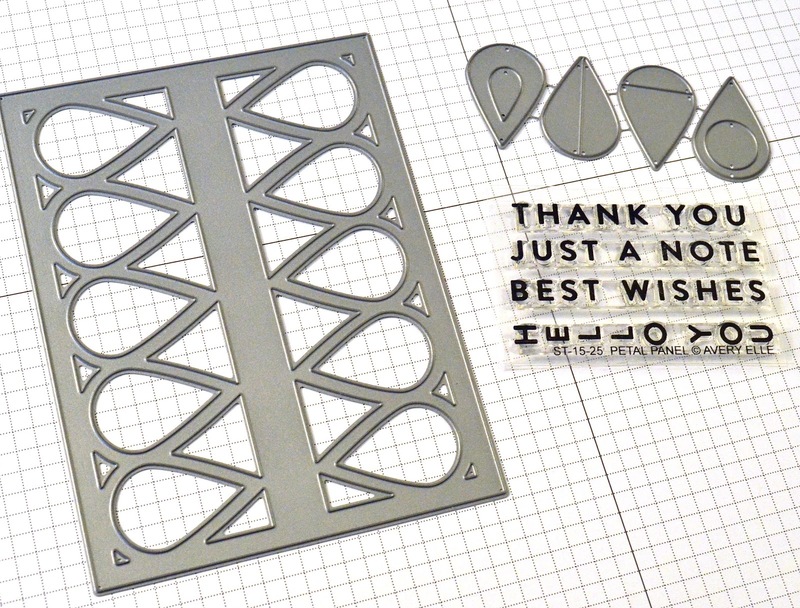 The Petal Panel die looks very interesting and cool that you have extra options for the technical people. The geeks are so cute! I'm just so excited for You. Paulette S.
since blogger/Google won't edit my expired blogger profile, bizarre they won't let go of a Profile for a blog that no longer exists on their site! really excited to see the whole reveal and the DT work. Your card is so so sweet! What they said!! Love everything! where did i can get this stuff in malaysia????????? ?